in a zipped file so you can save it on your computer for later viewing, and send to family and friends. Gaetano & Silvana Marinelli's sons, Marco & Danny have recently opened a new restaurant, the "Houston Steak House", located at 1001 Square Victoria in Old Montreal. They would like to invite everyone to come and check it out. Happy Hour between 5:00-7:00 p.m. is hosted by a live DJ. We wish them great success. 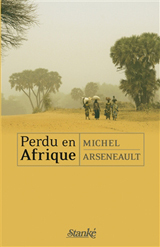 Mike Arseneault has a book out - Perdu en Afrique, published by Stanké in March 2009. It's a collection of his journalistic reports concerning the social, political and economic problems that he's seen first-hand working in Africa.